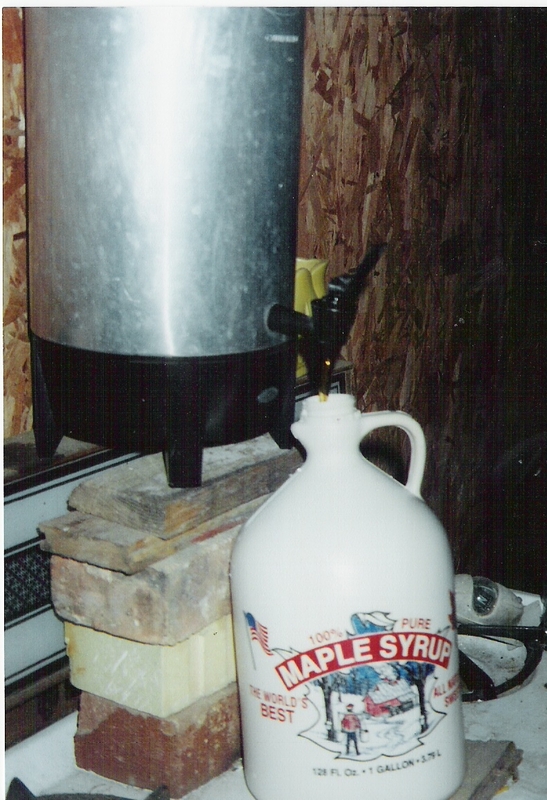 This is a page about my second favorite hobby... making maple syrup! My dad is probably thinking, "put the camera away and get over here and help!" My dad, Kent, and his brother, Mark, have been making maple syrup for a long time. My dad got the idea because his own dad and uncles used to tap trees when they were younger. After a lot of trial and error and tapping more trees every year, my family now taps about 250 trees every year. 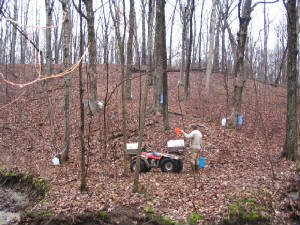 Depending on how the weather cooperates, we can sometimes make 50 gallons of syrup a year. It is a lot of hard work and patience, but it is very rewarding. One weekend out of the year, my family hosts an open house for the public to come and enjoy our fun pastime. We sell the syrup in many sizes of containers which make great gifts (like pints and cabins) or gallons for the whole family! I eventually would like to make an entire site for Maple Syrup. Making maple syrup is fun tradition in our family. My dad taps the trees each spring and hangs all the bags himself. My dad built racks to go on the 4-Wheeler so that it can carry up to 50 gallons of sap per trip. He collects the sap every couple days in a rotation and we store it in a cattle waterer before evaporating it. Last year, our family bought a new evaporator that is very efficient; it boils the sap faster and holds more at once. It is a great addition to our family business! Did you know that it takes 50 gallons of sap to make one gallon of pure maple syrup? A bag hangs in the woods collecting sap. This is one of our bags hanging on the trees of a Sugar Maple tree. Each tap is drilled every year and some trees that run well can have up to 4 taps. After the hole is drilled, a small metal or plastic tap is hammered into the tree. Then we hang either a bag or place tubes that connect together and lead to a larger collection area. Some of the trees produce enough sap to get their own 5 gallon jug, while others only get a single bag. We have several "flows," which are strategically placed on hills. In this way, we can collect larger amounts of sap (as much as a cow waterer) in a more efficient manner. After all, it takes a lot of coordination and strength to walk up and down these slippery hills carrying a 5 gallon jug full of sap in each hand! 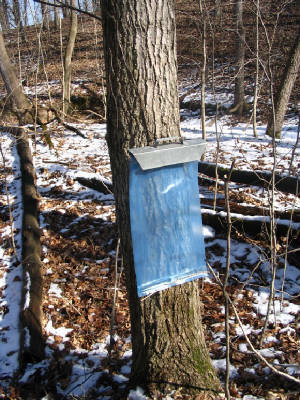 By taking a short drive in almost any direction, you can see our blue maple syrup bags hanging on the trees collecting the sap. After all, the run of the maple trees is the first true sign of spring! One of the jugs is being filled before being sealed. We have an Open House each year! Our facebook page can be found at "Phillips Brothers Maple Syrup" for more pictures and information!